I mentioned earlier this week Bernard Avishai’s piece on the almost-nearly-but-not-quite peace deal Ehud Olmert and Mahmoud Abbas all but consummated in 2008. Read the whole thing. Weigh it in light of what Avishai (and others, including your current absolutely non-expert correspondent) think is a last-best-hope raised by the Egyptian political earthquake. All of which is to say that I will tomorrow morning be calling my representative and senators and leaving messages at the White House and State Department switchboards to say that I support the rapid resumption of a strong US – led effort to bring the Olmert-Abbas almost-deal to fruition. Follow suit as your judgment suggests. In the meantime, again, I urge y’all to read what Bernie has to say. 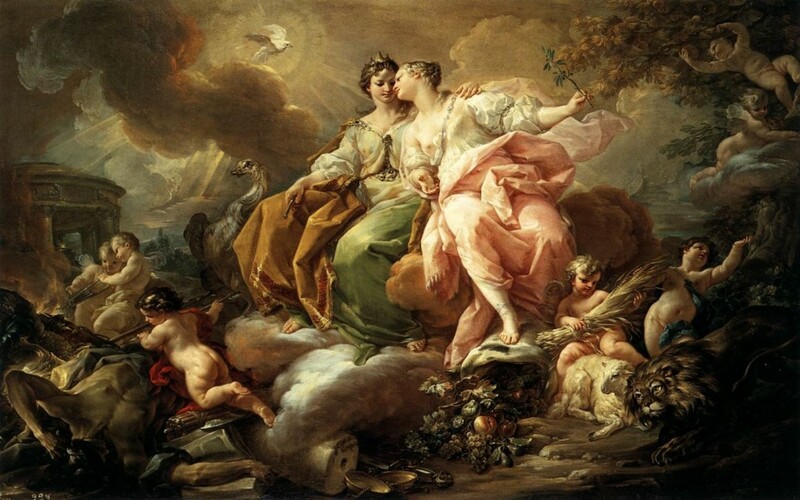 Image: Corrado Giaquinto, Justice and Peace, 18th c.
This entry was posted on February 13, 2011 at 2:39 pm and is filed under Foreign Policy, Middle East. You can subscribe via RSS 2.0 feed to this post's comments. You can comment below, or link to this permanent URL from your own site.